AIR POWER SOURCES 50 October/November 2018 unmanned systems inside California, Mothership raised a seed round of $1.45 million to build and deploy TerraSoar, which off icially launched in September. The price of its Scout starts at $30,000, while its Sentinel and TerraSoar sell for upward of $150,000 fully loaded, Nutzati said. The Scout is available now, while deliv- eries of the Sentinel and TerraSoar are scheduled to begin at the end of 2018. So far Mothership has had two ma- jor customers commit to buying air- craft, with one client pledged to buy- ing 10 airships in 2019, Nutzati said. Although these customers have asked to remain anonymous at this time, they are government agencies and in- frastructure stakeholders, he noted. Although helium supplies can un- dergo shortages, "as of right now, it is plentiful enough for what we are doing," Nutzati said. "In the long term, it is not too difficult for us to employ hydrogen or heated air to replace helium." 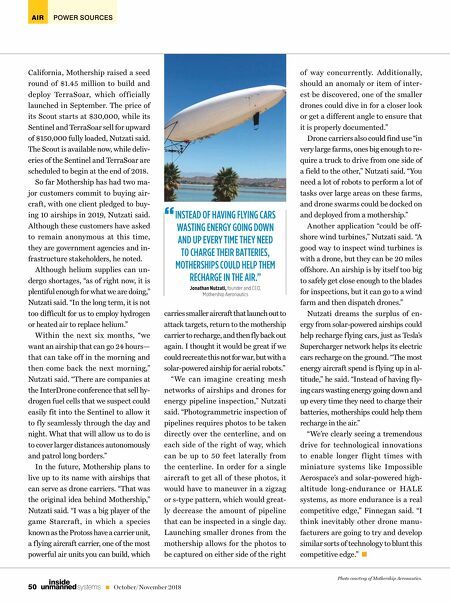 Within the next six months, "we want an airship that can go 24 hours— that can take off in the morning and then come back the next morning," Nutzati said. "There are companies at the InterDrone conference that sell hy- drogen fuel cells that we suspect could easily fit into the Sentinel to allow it to f ly seamlessly through the day and night. What that will allow us to do is to cover larger distances autonomously and patrol long borders." In the future, Mothership plans to live up to its name with airships that can serve as drone carriers. "That was the original idea behind Mothership," Nutzati said. "I was a big player of the game Starcraft, in which a species known as the Protoss have a carrier unit, a flying aircraft carrier, one of the most powerful air units you can build, which of way concurrently. Additionally, should an anomaly or item of inter- est be discovered, one of the smaller drones could dive in for a closer look or get a different angle to ensure that it is properly documented." Drone carriers also could find use "in very large farms, ones big enough to re- quire a truck to drive from one side of a field to the other," Nutzati said. 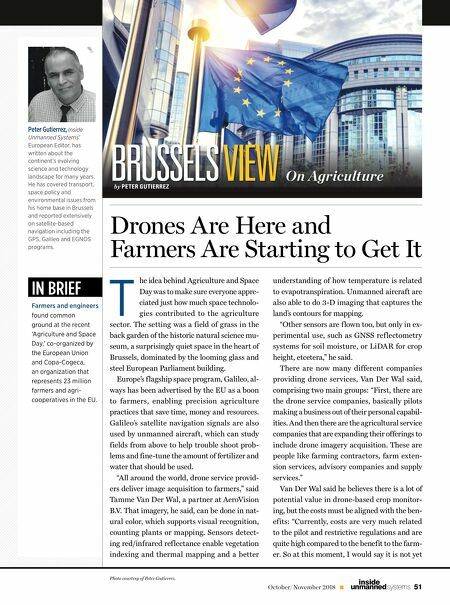 "You need a lot of robots to perform a lot of tasks over large areas on these farms, and drone swarms could be docked on and deployed from a mothership." Another application "could be off- shore wind turbines," Nutzati said. "A good way to inspect wind turbines is with a drone, but they can be 20 miles offshore. An airship is by itself too big to safely get close enough to the blades for inspections, but it can go to a wind farm and then dispatch drones." Nutzati dreams the surplus of en- ergy from solar-powered airships could help recharge flying cars, just as Tesla's Supercharger network helps its electric cars recharge on the ground. "The most energy aircraft spend is flying up in al- titude," he said. "Instead of having fly- ing cars wasting energy going down and up every time they need to charge their batteries, motherships could help them recharge in the air." "We're clearly seeing a tremendous drive for technological innovations to enable longer f light times with miniature systems like Impossible Aerospace's and solar-powered high- altitude long-endurance or HALE systems, as more endurance is a real competitive edge," Finnegan said. "I think inevitably other drone manu- facturers are going to try and develop similar sorts of technology to blunt this competitive edge." INSTEAD OF HAVING FLYING CARS WASTING ENERGY GOING DOWN AND UP EVERY TIME THEY NEED TO CHARGE THEIR BATTERIES, MOTHERSHIPS COULD HELP THEM RECHARGE IN THE AIR." Jonathan Nutzati, founder and CEO, Mothership Aeronautics " carries smaller aircraft that launch out to attack targets, return to the mothership carrier to recharge, and then fly back out again. I thought it would be great if we could recreate this not for war, but with a solar-powered airship for aerial robots." "We can imagine creating mesh networks of airships and drones for energy pipeline inspection," Nutzati said. "Photogrammetric inspection of pipelines requires photos to be taken directly over the centerline, and on each side of the right of way, which can be up to 50 feet laterally from the centerline. In order for a single aircraft to get all of these photos, it would have to maneuver in a zigzag or s-type pattern, which would great- ly decrease the amount of pipeline that can be inspected in a single day. Launching smaller drones from the mothership allows for the photos to be captured on either side of the right Photo courtesy of Mothership Aeronautics.